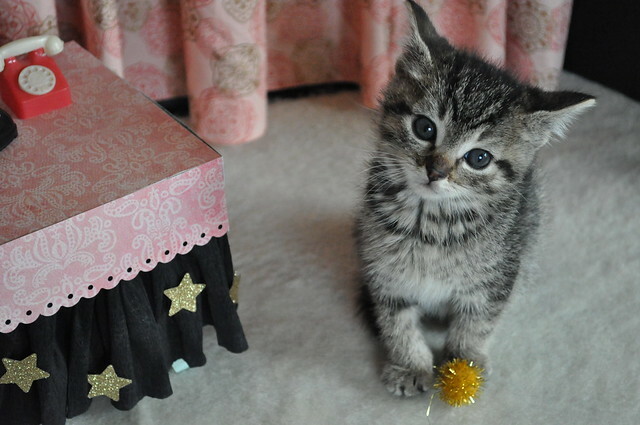 The Itty Bitty Kitty Committee: One Week Behind Us! One week into the fundraiser, we're closing in on $20,000! I thought we might clear it this weekend, but it was awfully quiet around the fundraiser set on Sunday. That fine, it gave the kittens a chance to relax and rest up. They were working awfully hard last week, weren't they? I bet if we rallied , we could reach that 20 squillion mark today -we need roughly $1900 to get there. Last week, we had $3000 and $4000 days, so I know it can be done! Well, hello there Phoebe. Is there something you would like to say? I just have a question. If we raised $1900 today, would that buy a sparkle ball for every cat and kitten in the shelter? Why yes, Phoebe, it most definitely would. And then some. So let's see if we can do it! To find out more about our fundraiser and to make a tax-deductible donation, please click HERE. Thank you everyone for your enthusiasm and generosity. We appreciate your support so much! Liberty and sparkle balls for all! Well done so far. Cute photo. ... wait... Theo from CO met the Dearborns?! You had Teho from CO in your HOUSE? With your KIDDENS???? I don't know who is luckier... you, the kittens, or Teho!!!! I'm totally jealous of ALL of you. S certainly got it right: worlds of cuteness colliding. Marbles asked me to communicate her approval of Meg's comment. I am thrilled at the progress made so far...i hope it can keep up. Though I spent my allotment already, darn it!